A few days ago I encouraged people in the photography and filmmaking community to shine the light rather than spread darkness. It was my answer to the amount of drama that was brewing in BOTH industries (for different reasons). The bigger of the two dramas was by far the controversy served up by ex-wedding photographer and Showit Fast CEO/founder David Jay and his “Photo System.” The internet exploded in blogs, Facebook posts, tweets and Tumbles about the travesty of it all. Countless hours were lost as people all over the world read super long blogs posts (kinda like this one here). So I wanted to try an experiment. Let’s see if instead of all the negativity, we could get as many people as possible praising photographers (or filmmakers) they DO like, and sharing why. Because in the end, I know that the drama has the negative effect people expect. It never serves the industry. It will only bring it down. As always, I approach this subject with objectivity and practicality. Ironically, not until I was challenged by Alexis did I even read the The Photo System thoroughly. I have no doubt some of you may disagree with some of my sentiments below. All I ask is that before lashing out due to the emotion of it all, take some time to really sit on and think about what I am going to share. So, let’s begin with the one part of “The Photo System” that seems to be the biggest bug up people’s you know what. Robert Evans is a highly respected wedding photographer with a very successful studio in Los Angeles, has shot over 800 weddings in over 22 years, including the wedding of a Mr. Tom Cruise (and I think Lenny Kravitz too). Once on an episode of my video podcast “The FlipSide,” (where I ask photogs and videogs to give one simple, quick bit of advice. “Bit sized advice shot on a bit-sized camera.” Clever huh? Anyway, I digress). I asked Rob to offer some quick advice to photogs starting out. You know what the tip he gave was? Spray and pray. (Just the messenger folks). I’m not a photographer so I haven’t looked into why these two respected professionals have suggested spray and pray and/or using P-mode. I vaguely remember Joe explaining at a Pictage conference how and why he uses it occasionally. But I don’t think that even matters. I just found it a very interesting observation in light of the controversy. Do with it what you will. There are many tips DJ mentioned in that system I would totally get behind: making friends; using minimal amount of equipment; effectively using social media; serving others; charging a high fee and including the “products” in the service; putting the value on YOU as the artist; many of his workflow suggestions; having a unique website; having a promo video (this was my favorite part 😉 ); listing your phone number on your site; keeping your logo simple; blogging; extensive and effective communication with the client before the wedding; what to prep before the wedding. I’m going to stop right there because it’s actually making me frustrated having to list it all. That is a lot of information. Information I didn’t even know was in the system because prior to last night, I hadn’t read it that closely. Based on everything I’ve been reading, I thought the whole system was filled with terrible photography advice. Now that I have read it, all I can say is: “Am I missing something?” Spray and Pray and P-mode make up like 2% of the whole system. So, you mean to tell me, all the lost hours, the long blog posts, the tweets, the hash tags, the vitriol…all of that was caused because of something that was a hugely insignificant part of the whole system? Let’s assume you hate the spray and pray and P mode advice. Well what about the other 98% of the system that you didn’t mention. Is there ANY value in it? If yes, why not say that? To do a review of a photography BUSINESS system and not give a full analysis vs. a clearly emotional reaction to one tiny aspect is akin to journalistic irresponsibility in my opinion. You can still give the System an overall poor grade if you like, but if you’ve covered ALL the bases, I then can take your analysis of it more seriously as an objective, rational, level-headed review. Then give the sources. THAT is the kind of review I think would have genuinely helped the industry. Just that one little paragraph and we could have been done with it. Including prices on your site. I think that makes it easy for people to shop you around without contacting you. Not sure I agree with the “hour glass” method. I wouldn’t have had a photo of Mother Theresa for the “Serve” section. Using her image for a commercial enterprise seems sacrilegious, even if you’re sincere in your belief to serve. Instead I would have a photo of Kenny Kim. Kenny is a real-life example of servant-hood in the photography world who has a huge following precisely because of his servant attitude. Show me one ounce of proof that the drama that has stirred up over the past week has helped the industry. The people who love DJ love him even more now. The ones who already hate him hate him even more. If I were a newbie, I’d just be more confused by the drama. What if instead of complaining about DJ and how his system is hurting the industry, write a long blog post to say why it’s important for newbies to understand their camera. Call it “The REAL Photo System” or something, making it an obvious allusion to DJ’s thing. THAT would help. You are actually then TEACHING something. But if you go all “Days of Our Lives” on him and all you do is spew vitriol about what someone else is doing which you think is hurting the industry, but don’t take that time to explain how you think it should be done right, all you’re doing is fueling the fires. Again, from what I can see, the drama has not helped the industry one iota. There has LITERALLY been MILLIONS of dollars in lost productivity in the industry over the past week. For the most part I don’t believe in publicly calling people out. I did it once on my blog and I regretted it afterwards. As I mentioned yesterday, I briefly did it last week on my personal blog, then almost immediately retracted what I wrote. Why? Because it NEVER, EVER leads to anything good, and as I’ll allude to later, you will ultimately just draw more attention to the very thing you dislike. IMHO, the wise thing to do in situations like this is to ignore the thing you dislike or disagree with, then proactively teach what you think IS right. Check out these tweets regarding DJ’s system. And one of the reply tweets nails it on the head. @zarias I like the idea of ignoring it too. I think there are too many that are seeing this crap because everyone is talking about it. BINGO! Instead of complaining about it and making it more popular, go make your own system that is better. I know my dear friend Zack Arias wrote a long Facebook reply to DJ and he made some excellent points in it, but this one short tweet of his is by far the best advice I’ve seen regarding this thing. When other leaders in the filmmaking industry teach or encourage something I think is bad, I don’t use my platform to call them out. Instead I passionately and vociferously teach what I think will help filmmakers. There are leaders in the industry who either specifically teach or by their actions practice work that is counter to all of these things. And in many cases I think it’s bad for those watching. In appropriate venues I have addressed those people about these issues (e.g. a formal interview, comments on a private forum, etc.) And when I do, I earnestly strive to do it in a spirit of respect and diplomacy. But If I wrote a scathing blog post every time a leader in the industry did or taught things which are the opposite of these things above, there’d probably be ten times more drama in the filmmaking world than there already is. Instead, I stay focused on what my experience has taught me, and I put it out there for the world to see. I know the world will hear and see some education that is conflicting. It’s up to the world then to deem which methods they feel is better suited to them. To me that’s far better than them reading public battles among industry leaders, like kids watching their parents fight. Last year, popular emerging-church pastor Rob Bell released a controversial book called “Love Wins.” It rocked the Christian world pretty much the same way DJs photo system is doing here in the photog community (I’m sure DJ would love being compared to Rob Bell). Lots and lots of pastors and Christian bloggers blogged about how terrible the book is in relation to the Christian gospel. You know what: they blogged it right to the top of the NY Times bestseller list. This is how my pastor handled the topic. He gave a very powerful and compelling sermon that anyone “in the know” would obviously know was meant as his rebuttal to the controversial topics in Rob’s book. Yet not once did he mention Rob’s name or his book. It was one of the greatest demonstrations of wisdom I’ve ever seen. On the off-chance that one of the 12,000 attendees of my church didn’t know about Rob’s book, they still wouldn’t. (Many of whom are “newbie” Christians, or people considering the faith who may not even know Rob Bell). Those that did know about the book, heard a loving and well-reasoned argument against it, one that wasn’t emotional. So no matter how you may fall on the “Love Wins” debate, you now had a reasoned argument against it and could make a more informed decision. Guess what, as Gary Fong rightly pointed, all the Photo System drama did (including, ironically, his own blog posts) was to lend more eyeballs to the very thing all the drama stirrers hate. How ironic is that? Both Rob and DJ are laughing all the way to the bank. (I”m sure they’re not really laughing, that’s just a figure of speech. But, you get my point). Lastly I’ll say this: it’s obvious that my faith forms a lot of how and why I do the things I do (sorry Gary. 😉 ). So I hope it’s no surprise that part of my take on this issue stems from that. There is a part of the bible that ironically many people in this industry have heard probably dozens, if not hundreds or even thousands of times. It’s one of the most popular verses read at weddings. It says that even if what you say has truth, if you say it without love, you might as well be banging a gong. That’s what we’ve been hearing and reading IMHO. A lot of gong-banging. I’m not saying you have to love David Jay. If you’re not a Christian, I can’t judge you in that regards nor expect you to do that. But you don’t even have to be a Christian to see that there is truth in that verse. If a sage and experienced photographer, respected in the industry, took DJ aside and had a respectful, heart to heart about how you feel this is affecting the craft of photography, I know that would have a far more powerful affect than what’s going on now. So there you have it. I encourage you to at least ponder what I’ve written. I have a busy weekend ahead shooting a number of projects (including my entry for the Chick-fil-A Leadercast film). So my replies to your comments may be slow coming. But as always, I encourage you to comment. Agree or disagree, I want to hear from you. I hope you can do it in the spirit and respect of the guy that prompted this whole post. Alexis Cuarezma. Well said! In our reality TV drama thriving society its easy to get caught up in our emotions. With social media at our fingertips we hardly think about what we are saying, it just spills out our mouth (fingers). Nothing wrong with disagreeing with someone its how you handle the disagreement that matters. It takes someone with true character to hold themselves together and accountable when disagreeing. Especially when you know you will probably never have to be face to face with this person. Lets think before we speak! God gave us a brain, lets at least try to use it! Great reflection man. I read this right after the backlash began and I was split. I remember hearing of DJ when I 1st got into Photography back in 2007-08. I was happy to hear and read someone willing to help out the smelly noob and read the books he recommended and watched his vids. I got a Showit Site and got his Showit Fast Slideshow program. I even went to his 1st Freedom Tour where he introduced JS to the world. I then began to hear negative rumblings about him on the web and in forums. He was still OK in my book. I stopped following him when I saw he stopped shooting. I garnered inspiration from working Photogs. However, I still respect him for what he’s done and how he helped me indirectly. I posted my opinion on his System in one of my groups last week. I’m not sure if it’s ok to post here so please remove if it’s not. 2. You are good enough = agree. Gotta be confident in your eye and ability and not think “other” things will bring you success faster. Advertisment for Showit = of course. That’s why he made this. No problem with that. Biz is Biz and he’s a master at biz. 3. Start Serving = Dude, why is there a picture of Mother Teresa there? I’m about to leave after seeing that. Basically he says that people won’t pay you for good “product” but for good service. Really? 5. Workflow = Basic WF but telling people to open files with LR’s Auto Develop Settings is not good advice. Of course we should use his “Brilliant” settings. How about telling folks to get the image correct in camera so they don’t need to Auto Develop? Yes, Exporting to Pass is another Marketing chance. $29 to give clients their files?? Really, people pay that? 6. Marketing & Branding = Basically get a Showit Site… although I like the idea of having a video answer questions about yourself. I’m working on that. Quote from DJ = “Don’t be Professional be Personal”…ummm OK…I think I understand what he’s saying, Don’t be Old or traditional, be young and hip. I’d like to be both. Myntd Advertisement = $1500 for a Custom Showit Site….good way to help out some buddies. No issue there. 7. Prepare = I like this page. Agree with it all. 8. Perform = This is the page that got him the backlash. Read it for yourselves but I know when I 1st started, I wanted good exposure all the time…still do. He’s never gonna recover from this advice. Calling out the “Old Pros”…bad man…bad. 9. Produce = More pushing towards Showit & Pass. While I agree that the world is digital now and that the iPad HD is gonna be awesome for Brides to share their images. I don’t think they will ever replace an Album. Batteries die, Tech is outdated. Imagine giving a client 30 years ago their Wedding on Beta or 5” Floppy Disks…where would you view them now? Albums don’t need batteries or software to view them. 10. Growing your Business = I agree to start low and keep raising. Problem is that when you start requesting 5k -10K you better know what your doing with your camera! So, don’t read part 8. Thank you = of course Jesus is first…sorry, I don’t really dig that part. Love reading your stuff. Thanks for your insights. What do you feel the hatred for the P and modes other than Manual is based on? I shoot in Program mode primarily and over ride as needed. If I buy a $8000 dollar camera, part of what I am paying for is the computer that figures all that stuff out. I am not going to shoot in P mode in a controlled portrait shoot but a wedding, where the lighting is constantly changing much faster than I can adjust, why not use the tool for what it is designed for? If I use a tool as designed, understand when to over ride, am I less of a professional? I am all for understanding what makes for a correct exposure, but I am a bit confused why you would buy a 1Dx and not take advantage of the brain in the camera when possible. I think many creatives are concerned with newbies not learning the essentials first. Using manual mode forces you to understand light and focusing and all the other elements that make your craft really work. Any kind of mode that makes it a shortcut can come off as cheapening the industry. You’re always a class act Ron. Thanks for the post. I think the biggest issue for many people is that instead of raising the bar of our industry, the PhotoSystem appeals to the lowest common denominator. It also leaves out 80% of what you need to know about business. Considering the failure rate among all business, I think that does a disservice. That said, there were many who DID offer a reasoned case against the PhotoSystem. I don’t have anything against DJ personally. The issue is that many of the leaders in our industry have invested HUGE amounts of time and energy to really raise the bar and help people start out right. For them (and for me) to see something so commercial, pretend to be a “proven system for starting your business,” is a huge disappointment. There are plenty of chicken-soup-for the photographer ideas in the PhotoSystem. The problem is that none of those things actually make you a better photographer, and they don’t help you pay your bills. It also leaves out the fact that building something sustainable is a lot of work – and doesn’t happen fast. I really think the biggest disservice is that it gives false expectations of what it really takes. Sharing the anecdotal experiences of a few outliers doesn’t give a roadmap for everyone else. Thanks for the comment Jason. I really value your input and your knowledge. It’s always frustrating replying to comments like this because then it appears that I’m some huge proponent for the guy so many people are pissed at when in truth, I have no vested interest in DJ or the System, aside from the fact I do consider him a friend (that I see like once over two years or so). And I feel no need to defend him. My main concern has been the affect on the industry. First, that’s great there were many pros who offered reasoned responses to this system. But this post is obviously not aimed at them. Second, regarding the issue of the system being a huge disappointment. I totally get that. But I fall back to the points I made in the post. If you all hate it so much, IGNORE IT. All you have succeeded in doing is making that which you claim to hate so much that more popular. And as I said, a lot more progress would be made approaching DJ in private to discuss rather than what I’ve seen. Like it or not, he has a huge following and exerts some influence. If you really care about having his influence do GOOD rather than bad, this is not the way to do it. Again, not defending DJ, just stating a fact. Re: the “chicken soup for the photographer” points in the system not making you a better photographer, again, as I said in the post, I don’t think it’s meant to make you a better photographer. And one could definitely argue your point about whether they help you pay the bills. Lastly, I really don’t think any reasonable person is going to look at a 10 page PDF-ish website as the end-all be-all to starting a photog business. It’s one piece of a puzzle. When I started my business I consumed as much info as I could. I think most intelligent adults will see this as it is: a simple, short, guideline for starting a business that is designed to feed more client’s into the Showit system. It’s pretty obvious to me anyway that it is largely a promotional piece for Showit with some useful information to make it worthwhile. That is not bad in and of itself. Businesses do that all the time. I love DJ and what he stands for. Nothing is right for everyone. Pick and choose what you like from something and move forward. Ron, The problem with DJ and his vocal supporters who are on the speaking circuit is that they tell the newbies exactly what they want to hear to give them self-bravado and to sell their products. It is really a very clever, albeit self-serving, message. It’s a marketing perfect storm: Jay creates popularity for a few new photographers like Jasmine and Scarlett who then go off and sing his praises. When these new “rockstars” are filling so many seats the conventions want them to speak which lends credibility where none is deserved. With 20,000+ new photographers entering the profession when the thousands that followed the piper last year fail and disappear he has thousands more to pitch to. I find this approach, especially with their “Christian values” and Mother Theresa unbelievably offensive and immoral. To counter the industry backlash Jay simply tells his followers to ignore the grumpies and old guard as they want you to fail. That’s a brilliant message for anyone to use who wants to dismiss the backlash from qualified individuals. If it was not so destructive to our profession we “oldies” could just shake our heads and brush it off. Unfortunately though, with their sense of bravado these newbies rush out, book weddings and often really screw them up. I know of many events where the photographer was a disaster. For example, no flash and shooting off a monopod in a very dark venue. The “pro” didn’t even know enough to pump up her ISO! I hear many stories. So, why should we “old timers” care? Speaking for myself, I care because young families are getting hurt and driven into bankruptcy by the siren song (if you buy my stuff) of overnight success. Unfortunately, because we are in an unregulated profession I don’t think there is much we can do about this. I love having your “voice” as part of the conversation Rick. I appreciate and value your input and experience. I totally get where you’re coming from. My main point here is that the strategy that is being taken is having the opposite effect. If those in the “old timers” camp really want to affect change, drawing more attention to the Photo Systems of the world is not the way to do it. I think the best way to do it is to find the influencers in the market who are on “your side” and create the antithesis. But the more people blog, tweet and Facebook about how bad it is, the more you boost it’s SEO and it’s exposure. This blog post is a perfect example. I had absolutely no intention on writing about The System. I was tired of the drama. I attempted to get people to get their minds OFF the drama. Within the context of THAT blog post, I was challenged to give my take on the System. Alexis hates The System, but by asking me to offer commentary, now there is another 2500+ word blog post about it, more discussion, more SEO and more exposure to the very thing he hates. The efforts of those against The System is back-firing. I’m with you, Ron! There are parts of the System I love and other parts I’d never say to someone starting out. It’s something I’ll still pass on though and just include my own advice as needed! The most important thing in this life is happiness – our own and those around us – and kindness and reason are absolutely the best ways to get there, not negativity or hatred. Meanwhile, I don’t think much credit is being given to the newbies, the so-called “victims” of the system. There’s this assumption that they’re gullible, unable to filter out the stuff that doesn’t resonate. But that’s a patronizing position to take. I’m fairly sure if you asked them if they’re aware of alternative opinions and leaders in the industry, they’d say yes. And if you asked them why they are choosing to support this one, the System, it wouldn’t be because they want to get stinking rich really quickly – it’s simply because the quality, quantity and positiveness of the presentation is more persuasive than the alternatives. I really hope Zack et al can come up with a worthy challenge because good competition is a wonderful thing. But they HAVE to let go of their anger first because if they let negativity become any part of it they’ve already lost. At first the whole system thing had me so angry, I was seeing red but then I realized that I was angry because I built my craft as a photographer to do just that….. Be a photographer and artist in the buisness of Photography. With 18 years as a Pro, im very happy and comfortable. If DJ want to be a buisness person marketing his products to amateurs and less experienced folk that beleive what he is selling, let him be. My clients in my market would send me packing if I adopted those concepts but, ive created a niche market for what I deliver. As professionals, we just need to see him for what he is… A ex-photographer who has taken his buisness in a new direction. If your a Proshooter, just dont drink the kool aide. Ron’s right let go and lets all do what are clients pay us to do. Be the truly talented Artist we truly are. Thoughtful post. I’d like to point out a few things. First, the few sentences you wrote about Joe’s use of program mode. Joe knows exactly how his metering system works. If he knows that something will be over or under exposed in P, he uses the exposure lock to find an accurate exposure close to his subject, recomposes, and shoots. The point is that he knows how his camera works, and does it very quickly. Joe uses skill and experience to make the P mode work. The second issue is the Spray and Pray being 2% of the system. How much does photography count in a photography business? Maybe the Spray and Pray should be more heavily weighted. At the end of the day, the photographs should be the most important thing. The comment about missing a moment because you are fiddling with the camera is another BS thing. You should practice until you can quickly set your exposure, using any mode that fits your style. Using P as a crutch because you don’t know your camera and the basics is complete BS. Learning to make a proper exposure seams pretty basic as a photographer. 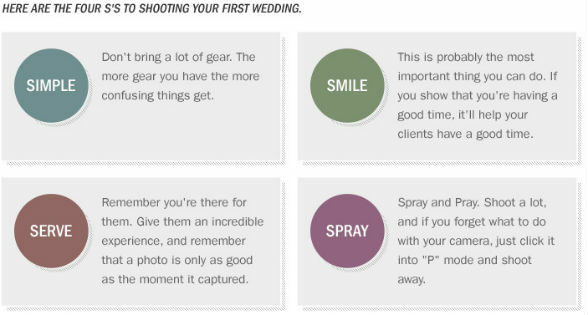 Don’t even think about shooting a wedding until you know your basics. Until you do, learn them however you can: a college class, self assignments, shooting in a studio after hours, playing in your living room, whatever it takes. Then, go shoot 50 or so weddings as a second shooter. Take on a wedding photographer as a mentor. Schlep around gear for pros. But heavens no, you should learn the basics at someone’s wedding, as the hired main photographer. It is wrong, immoral and bad for your fledgling business. I say throw the baby out with the bathwater on this one. Newer, gullible photographers may not distinguish the OK parts of the business from the total disregard for the photography bit. Thanks for your great comment Chris. I agree 99% with everything you said. Personally, I would never consider shooting a wedding until I felt comfortable enough with my equipment to do it. There are many ways a newbie can get up to speed, not the least of which assisting for someone else, or being a second shooter. But as I said in my post, a more well-balanced review of this would be to point out exactly what you said, while at the same time acknowledging the parts the make sense. People are acting like this is meant to be some kind of comprehensive education. It’s not. It’s more like a keynote presentation from a 1-hour WPPI seminar. Would you base your whole business on ONE 1-hour WPPI seminar? Or course not. It would be one piece of the puzzle. As Steven Seymour commented, give newbies some credit for being intelligent enough to collect data points from all the resources out there and make their best decision. Ot as Lydia commented: take what you like and throw out what you don’t. IMHO, no matter how you cut it, the level of drama and reaction to this “keynote presentation” was blown way out of proportion. That’s my main beef. Thanks again for your input. It was really great. I really enjoyed the blog article. You’re writing was subjective and you also seem to draw in intelligent, well spoken readers. Thanks for sharing.